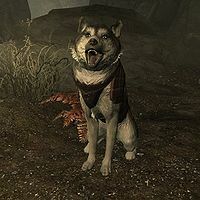 Bran is one of two armored huskies living in Fort Dawnguard, along with Sceolang. They can be found within a wooden pen in the cave section for Fort Dawnguard. Go past the forge and to the right of the armored troll pen to find them both. Each can be used as a follower if you join the Dawnguard. They function exactly like the other animal followers, having only 'wait' and 'follow' as commands, following the typical behavior of running and attacking things on sight, and are allowed to be recruited in addition to an NPC follower. Bran is one of the non-NPC followers that can become your pet with the Hearthfire add-on. He becomes available after completing the quest A New Order. Neither Bran nor Sceolang respawn if killed. This page was last modified on 16 March 2017, at 20:47.